Plastic bags used to be thought of as free, painless, no-brainer solutions to carry your groceries, and they even could be recycled as doggie-doo bags or bathroom trashcan liners. In recent years, even the most thoughtless of consumers caught on to the fact that there was more to the common plastic bag than meets the eye, if only for the fact that suddenly there is an array of non-plastic bags available at chain stores instead of the throwaway ones. Plastic bags are from the same source as all plastic: crude oil. Like everything else manufactured from this non-renewable resource, it has two major drawbacks: manufacturing it emits considerable amounts of pollution, and the product is not biodegradable. In other words, it is difficult to produce, and nearly impossible to get rid of once produced. According to the Natural Environment website, 60 to 100 million barrels of oil are required to manufacture a year’s worth of plastic bags worldwide, and it takes approximately 400 years at least for a bag to biodegrade. The impact of plastic bags on the environment is enormous. As of August 2010, between 500 billion and 1 trillion plastic bags are being used each year worldwide. Approximately 100,000 sea turtles and other marine animals die every year because they either mistake the bags for food or get strangled in them, says Natural Environment. In Australia, 50 million garbage bags end up as litter yearly, and the “plastic soup” patch floating in the Pacific Ocean is twice the size of the continental United States. It is roughly 80 percent plastic, according to The Independent, a British newspaper. 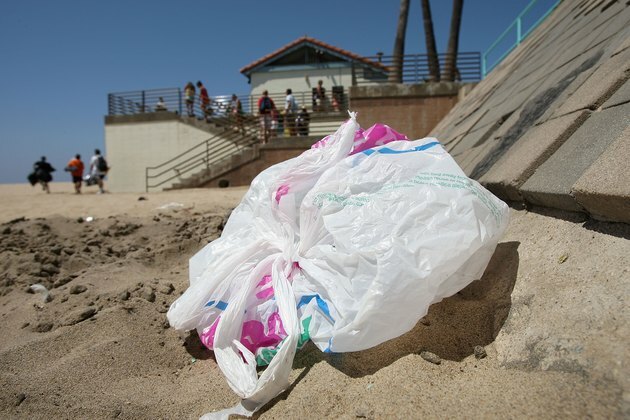 What exactly the impact of reusable bag usage in the U.S. is far from clear. Even though, according to the website Earth 911, reusing or recycling one ton of plastic means the equivalent of 11 barrels of oil are saved, the argument sounds hollow when you consider once the bags exist, they are here to stay. You can recycle them into anything you want, but ultimately, they will be discarded. Whether in the form of purses crocheted from Target plastic bags or as doggie-doo bags, plastic always remains plastic. Every U.S. grocery chain carries cheap reusable grocery bags as of August 2010, ranging from 99 cents to about $5. More upscale bags are available in practically all chain stores, from bookstores like Borders to Whole Foods. In addition, many people sew their own from leftover fabric, or by converting old jeans or beach towels into personalized carry-on bags, which is a fun and creative way to recycle. While some governments are taking steps to reign in plastic bags or ban them outright, other countries are seriously lagging behind. In 2008, China started to ban stores from offering free plastic bags; previously, China had been using 3 billion plastic bags a day, according to Treehugger. One of the most substantial efforts has taken place in Ireland, where a tax has been issued on each plastic bag. Paying the equivalent of 20 cents tax per plastic bag used in a store has led to a 95 percent decrease in usage. National Geographic: Are Plastic Grocery Bags Sacking the Environment?